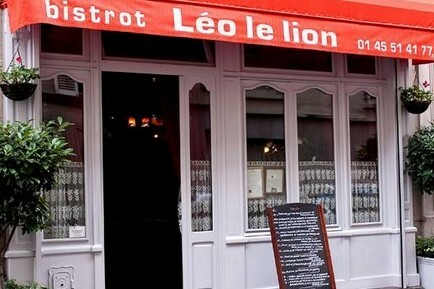 Léo le Leon on the rue Duvivier in the 7th arrondissement. Will the Lion roar after a fantastic meal, or whimper over dashed expectations? The Experienced Travelers have passed Léo le Lion in the rue Duvivier many times over the years. The online reviews were positive, so it was time to try this neighborhood restaurant. This was Barbara and Chris’ first dinner out in Paris, and we wanted it to be grand. 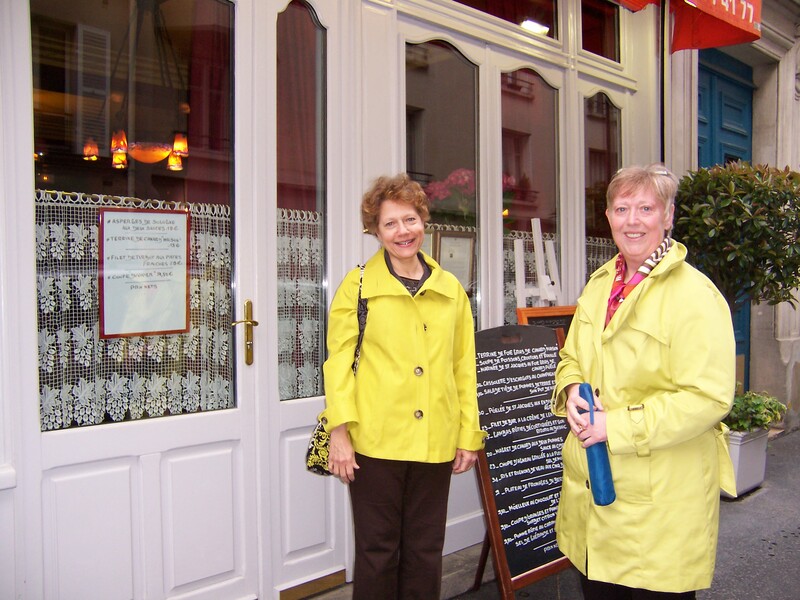 Barbara and Julie consult with a local over Léo le Lion’s menu. Barbara and I joined another lady reviewing the menu. 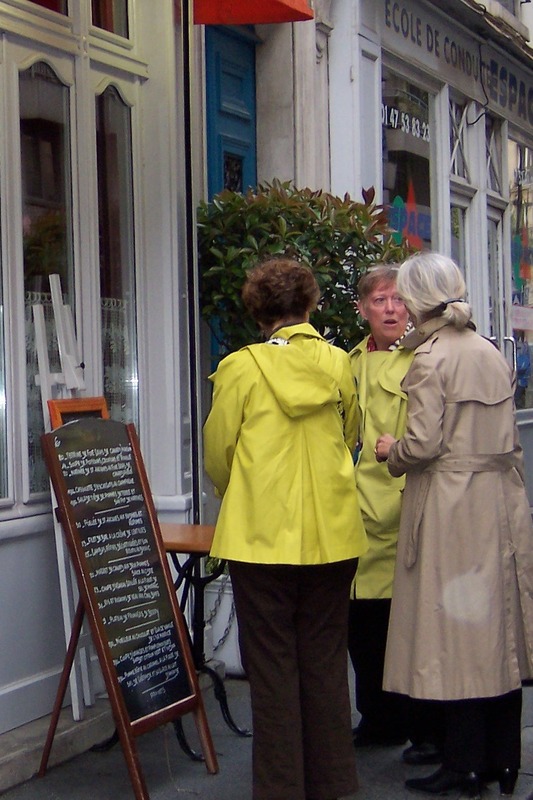 When I asked if she had eaten here, she said no and immediately started pointing up the street toward Le Florimond. Once I assured her we had reservations at Le Florimond the following week, we debated the finer points of the menu and she agreed that we should carry on. Was this a premonition? Would we spend the evening chez Léo wishing we were down the street chez Laurent? So in we went to a cozy room done in dark red and pink – hues that will flatter every girl’s complexion. The tables were a tad snug even for Paris, and those of us in straight-backed chairs wriggled and shifted our way through the meal. But the meal was what we were there for, and so, dear Readership let’s dig in. Nurse’s Gambas rôties décortiquées et leur rizotto au basilique. Beautiful and bountiful. 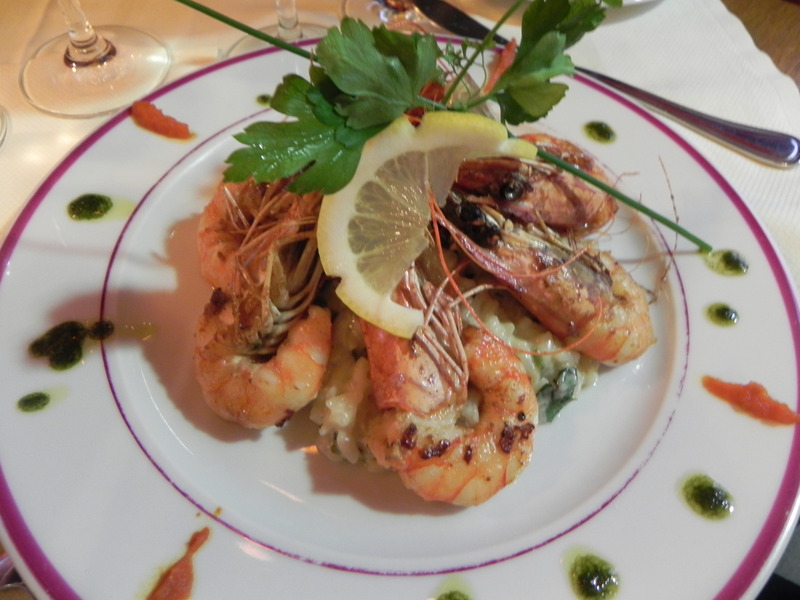 Nurse had shrimp with a risotto that she’s still talking about. Our waiter explained that the arborio rice was cooked in chicken broth with fresh basil, a touch of garlic, salt and pepper. Simplicity at it’s best. I don’t recall that she shared her shrimp, which tells me all I need to know. My Filet de bar au four à la crème de lentille. Two things I wouldn’t have put together that heretofore shall always be together! 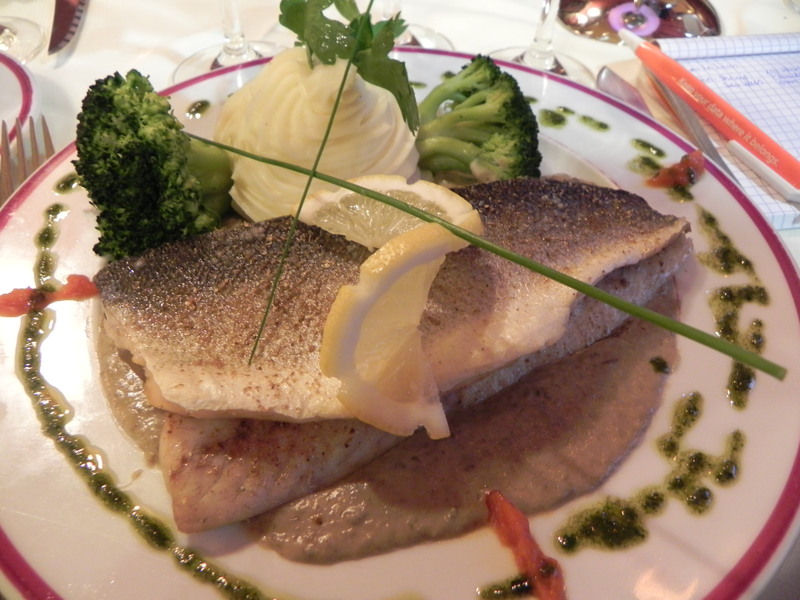 My filet de bar was similar to sea bass and the lentil cream was a wonderful surprise. I had to make choices here, and decided to leave the broccoli behind in favor of the fish, sauce and mashed potatoes. Altogether, it was a wise strategy. The duck in cider sauce arrived looking like it had been passed over a match, so Chris took the risk and ask for it to be cooked a little longer. 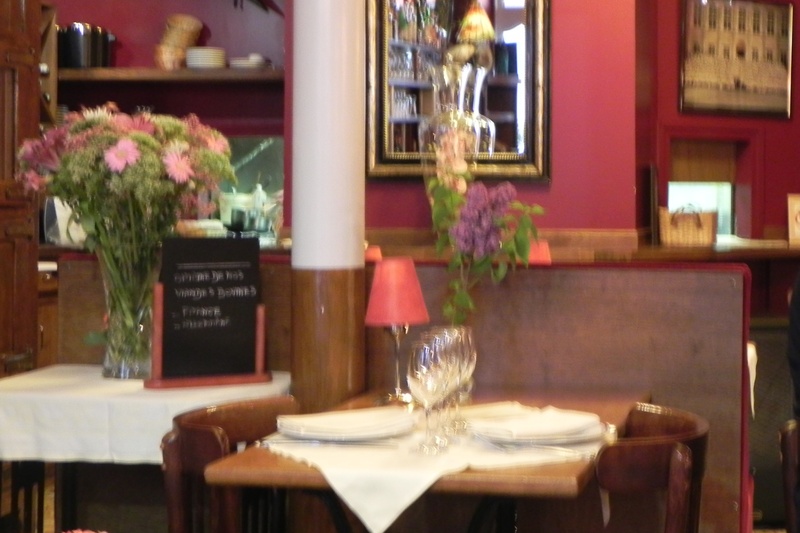 This is a Parisian restaurant so we took cover and expected a tirade of abuse from the waiter, or worse, the chef. What a relief when her dinner returned, cooked the way she wanted it, accompanied by nothing more than a smile. What they said about us back in the kitchen is a mystery and it shall remain thus. Barbara’s scallops were perfectly done and brought a smile of delight. They must have gone well with the chardonnay. I don’t know why we had chardonnay since Barbara doesn’t like it, but maybe the scallops made her forget. Better than needing the chardonnay to forget the scallops. The food was satisfying and inventive. 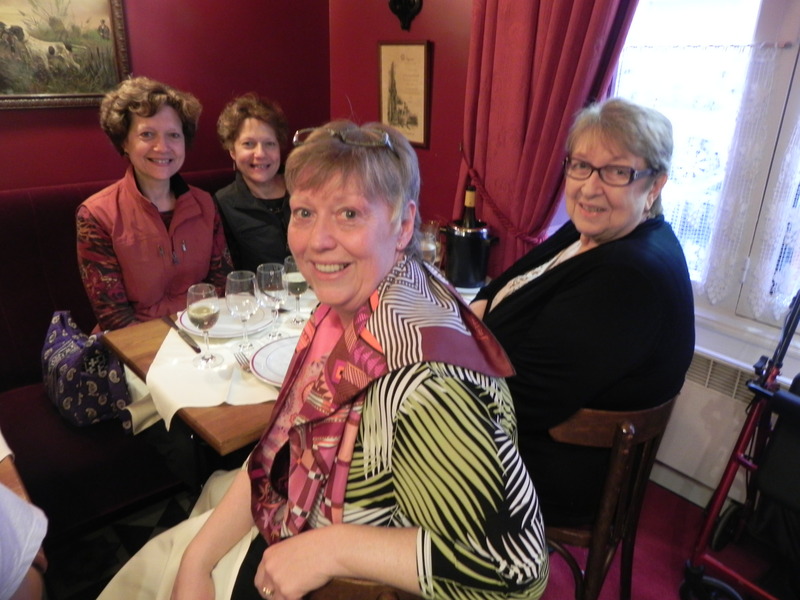 And it was a great meal for Barbara and Christine to inaugurate their dining experience in Paris. Our meal came to 118 euros for four plats and the bottle of wine. We thought the entrées were a bit expensive and decided to forgo them. So why did we decide to finish our wine and get dessert elsewhere? We think the room felt too cramped, even though it wasn’t full. Maybe it was those straight chairs. Maybe it was the waiter who pronounced “no kiss for you” when we opted not to have dessert. It’s not that we don’t recommend Léo le Lion. We appreciated the quality and care that went into our meals, but there was something we can’t define that made us ready to move on after dinner. So tell us about your experience at Léo le Lion and help the ETs bring closure to our questions! They are not yellow. They’re a very chic shade of green and we stand by that! I know you’re going to ask. Barbara and I independently brought new bright green raincoats. I can’t tell you how many people waited for us to raise closed umbrellas and lead a tour group back to the bus. I decided to break with the typical Parisian black coat and “go green” knowing I would be easy to find in any Paris crowd. So there. 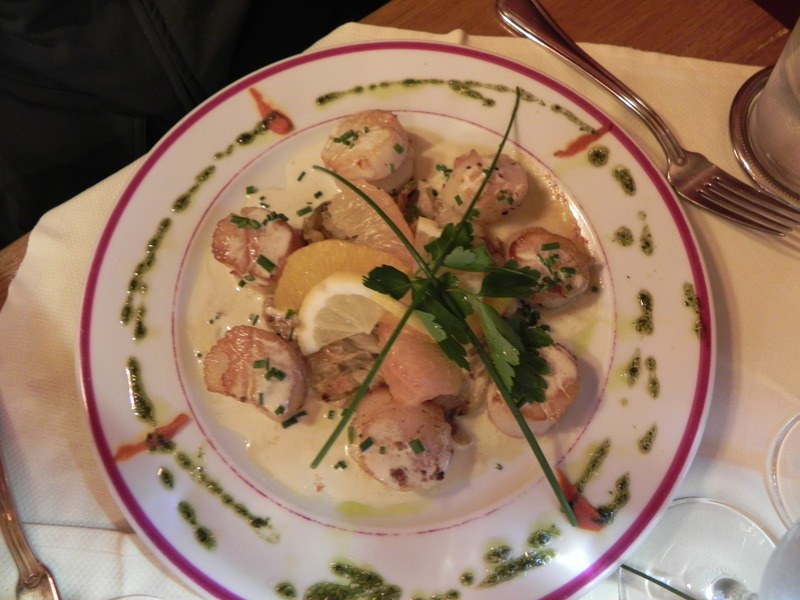 This entry was posted on July 12, 2012 at 7:34 pm and is filed under Dining, French food. You can follow any responses to this entry through the RSS 2.0 feed. You can leave a response, or trackback from your own site. Having never eaten at Léo le Lion I can’t explain why you felt the need to leave and get dessert elsewhere, but I have had the same feeling at other restaurants. There’s usually nothing definitive that calls for leaving, but I do know the feeling of “It’s time to move on” even when logic would disagree. I think that sometimes it’s just not feeling comfortable – whether it be because I spent more than I should have for something that wasn’t quite worth it or the waitron just isn’t up to par that evening. But whatever it is, it is real – and dessert down the street always brightens the mood! Tim you’re right about a “feeling”. Inexplicable as it was.. the dining room was lovely. Maybe it was our table. Who can say. Thinking back, maybe we were ready for some fresh air on a cafe terrace. I know what it was – it was “no kiss for you” – how rude! On the other hand I don’t recall, on our recent trip to Italy having any of our cute waiters even offer me a kiss. I think to help bring closure you need to return to Leo and demand that kiss. 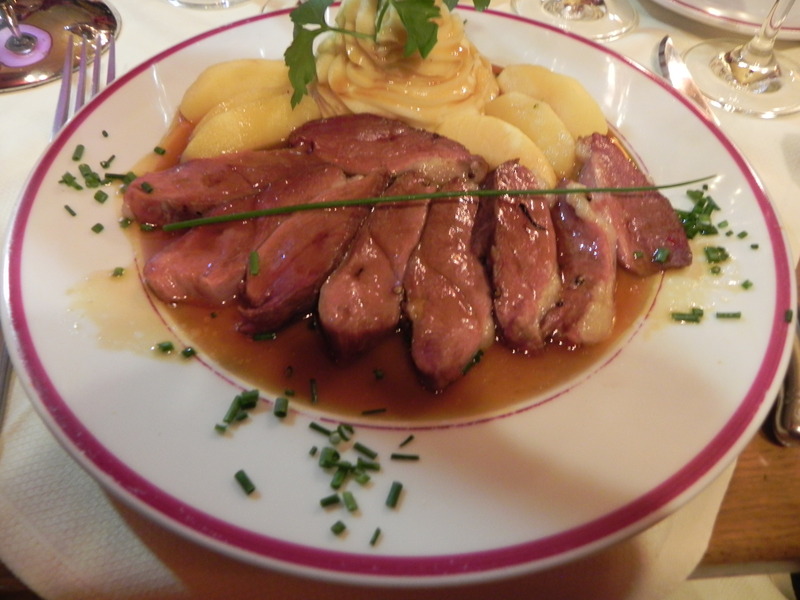 In any event you dinners look beautiful and kudos all around for being brave enough to return the duck. I don’t know that I would have. Victor I will demand the kiss on your behalf. (translated: reason to return to Paris soon). And yes, the duck incident had us on edge and drinking more quickly and there – it all turned out just fine. Really the food was good and they make their own foie gras and take care with the quality and service. I can’t sort out why I don’t unreservedly recommend…. Ohhhhhhh – fresh foie gras! I don’t give a goose’s patootie if it’s “incorrect”, I love it!